Surface properties of solids are of paramount importance in solar, transportation, biomedical and chemical industries. Solar panels require rough surfaces with high light absorbance for maximum efficiency, mechanical parts need tailored surfaces to minimize wear and adhesion, and biomedical implants need hierarchical surfaces to improve biocompatibility in-vivo. Control over the morphology and chemistry of a surface means the ability to control its optical (colors, absorption), mechanical (tribology, adhesion), and chemical (catalysis, biocompatibility) properties. Our research aims at better understanding and at controlling surface textures to tailor the optical properties, surface chemistry, and biocompatibility of surfaces. We showed that fixed colours (i.e. angle-independent or non-iridescent) can be created on the surface of silver and gold samples upon ultrafast laser direct writing. Colours result from the excitation of surface plasmons at nanoparticles generated by the laser writting process. We demonstrated the creation of these colours on large samples (up to 5kg and 20cm in diameter) with high 3D relief (more than 1.5 cm). More details here. Using a "burst technology", where laser pulses with small temporal spacing are used, it is possible to increase the electron-phonon coupling of silver and gold and more defined ripples (LIPSS). The combination of the LIPSS and nanoparticles increases the intensity (i.e. 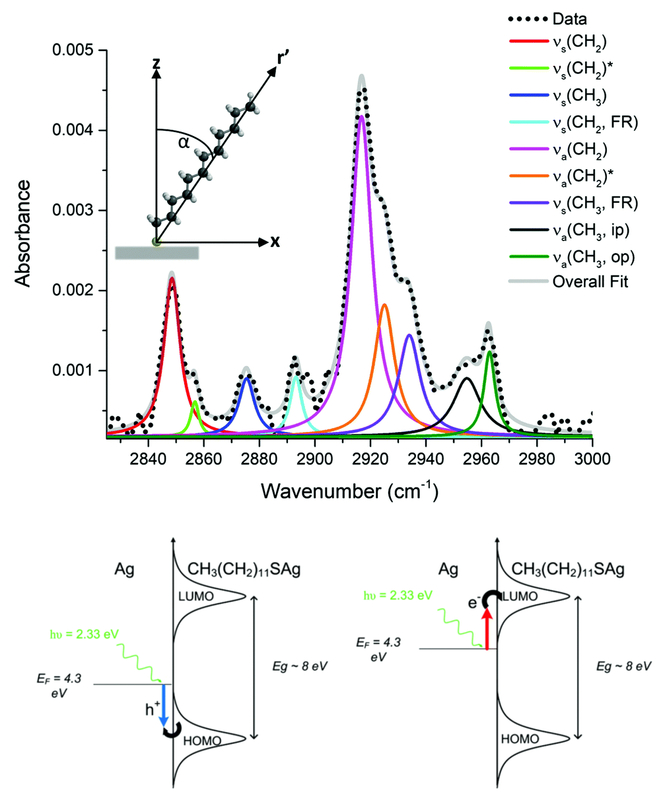 staturation) of the fixed colours significantly due to plasmon grating-assisted coupling. More details here. Laser written colours required proctection again tarnishing and high humidity. A new multi-layer passivation technique was developed in collaboration with Carleton University. It consists in the deposition of alumina films on the coloured surfaces that is able to maintain the initial colours while protecting them from the environment. More details here. Smooth microlens arrays were fabricated by focusing a nanojoule energy, high repetition rate femtosecond laser inside a polycarbonate sample. 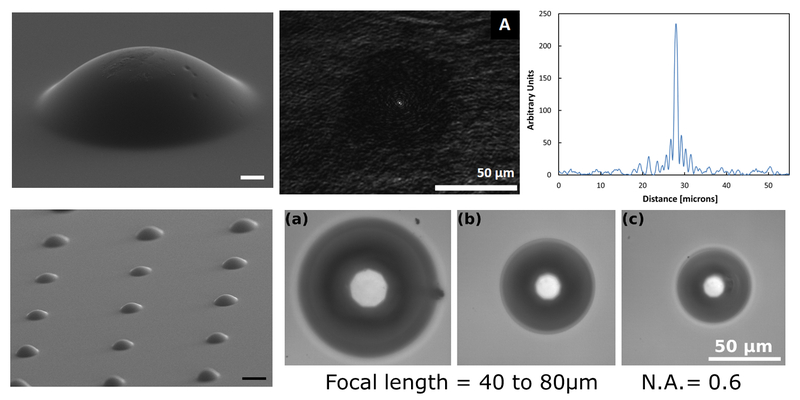 Heat accumulation at the laser focal point and subsequent material expansion leads to localized swelling at the sample surface that behaves as a microlens. By changing the depth of the laser focus in the sample, the focal length of the microlens can be controlled and varies from 40 to 80 um while maintaining a high numerical aperture of 0.6. This fabrication technique is a single step, controllable, and economical process that can produce arrays of optically smooth microlenses. More details here. 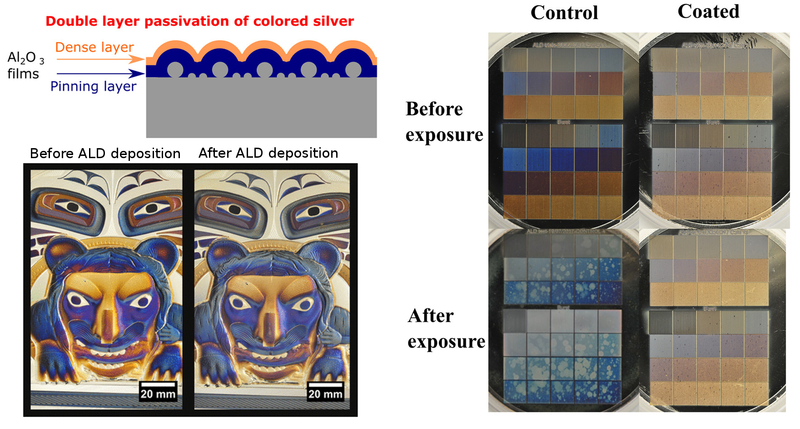 Plasmon assisted generation of silver sulfate from dodecanethiol was demonstrated on a nano-textured silver substrate with a strong surface plasmon resonance in the visible range. The observed photo-physical processes are attributed to hot charge carriers that are generated from the excitation of surface plasmon resonances using 532 nm laser light. Excited charge carriers are responsible for cleaving the alkane chain, and for generating reactive oxygen species which rapidly photooxidize the exposed sulfur atoms. The strong optical absorbance across the visible range, combined with the fact that the substrates can be fabricated over large areas, naturally makes them candidates for solar driven photochemical applications, and for large scale plasmonic reactors More details here. 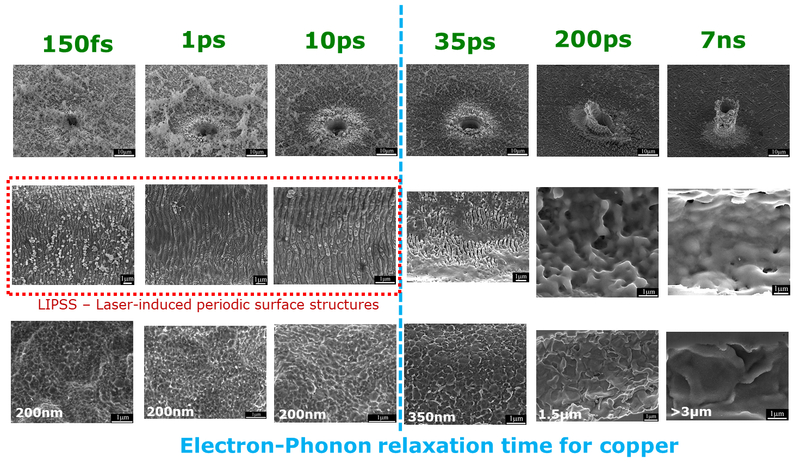 Laser-induced periodic surface structures (LIPSS) with periodicities of 300, 620 and 760 nm were obtained on titanium substrates upon femtosecond laser irradiation. 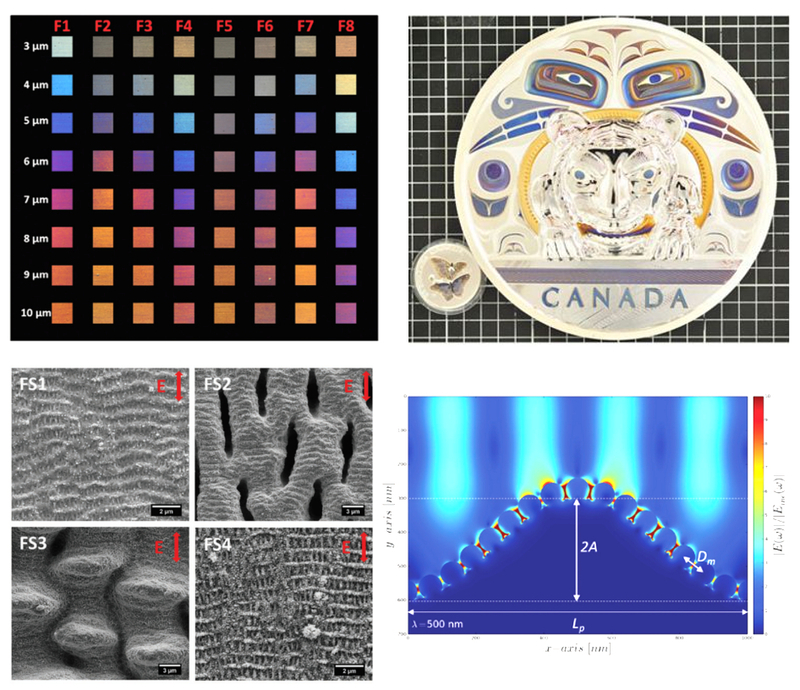 The reproducible rippled patterns showed consistent submicron scale roughness and relatively hydrophobic surfaces as measured by atomic force microscopy and contact angle, respectively. 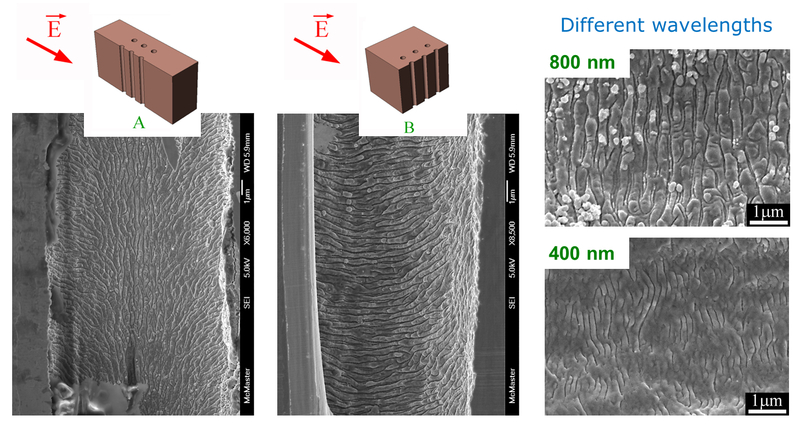 Transmission electron microscopy and Auger electron spectroscopy identified a thicker oxide layer on ablated surfaces compared to controls. In vitro testing was conducted using osteosarcoma Saos-2 cells. Cell metabolism on the laser-ablated surfaces was comparable to controls and alkaline phosphatase activity was notably increased at late time points for the 620 and 760 nm surfaces compared to controls. 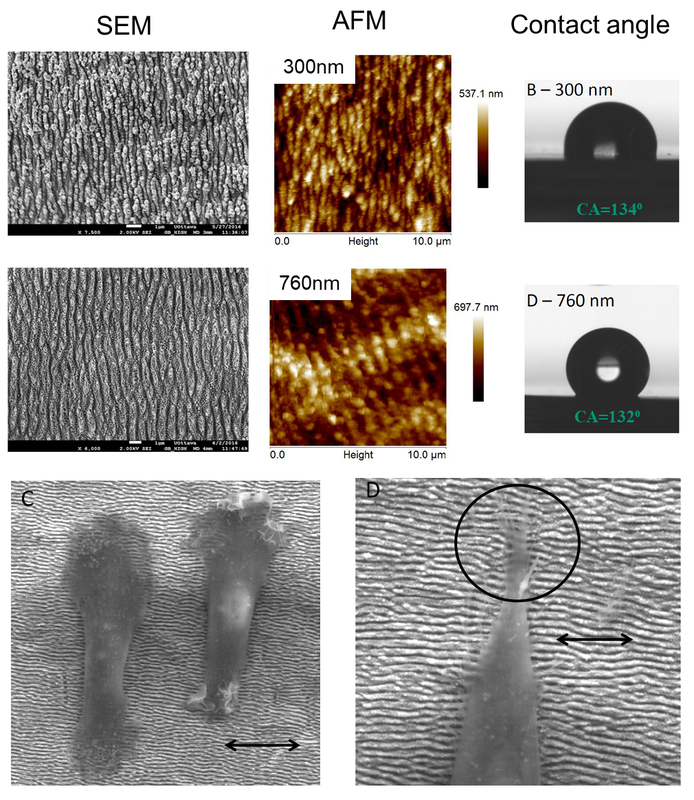 Cells showed a more elongated shape on laser-ablated surfaces compared to controls and showed perpendicular alignment to the periodic structures. This work has demonstrated the feasibility of generating submicron features on an implant material with the ability to influence cell response and improve implant outcomes. More details here. High aspect ratio holes were drilled in copper sheets. The effect of pulse lengths, from 150 fs to 7ns on the entrance and inside hole morphology was investigated. At a pulse length of several picoseconds (1-10 ps) there appears to be a transition from the material being mainly vaporized to being mainly melted. Pulse lengths of a few picoseconds (1-10 ps) are almost as efficient as their femtosecond counterpart and lead to the same morphologies inside the hole. However, short picosecond systems can have several advantages compared to their femtosecond counterpart such as lower complexity and lower cost, and reduced x-ray yield. Therefore, a few picoseconds would be a pulse time scale of choice in the micromachining of metals. More details here. Cross sections of deep holes produced by ultrashort laser pulses show a variety of microstructural formations. After tens of thousands of 800 nm wavelength pulses, the walls of the holes show distinct ripples with a period of 300 nm. It is demonstrated that these ripples are the result of light interference effects. Indeed, the ripples are perpendicular to the electric field of the laser beam and their spacing scales with the laser wavelength. Additional fine ripples with spacing of 75 nm were also observed. More details here. 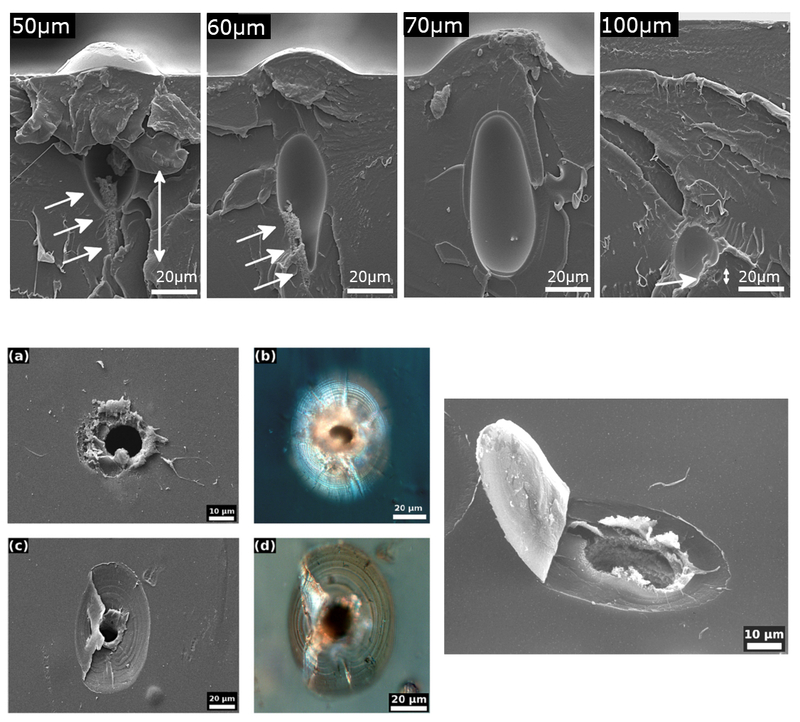 Spherical domes were created on the surface of polycarbonate samples, and microvoids were formed within the bulk using low energy femtosecond pulses (0.47 nJ). Size of spherical domes and shape of microvoids are controlled by changing the laser focus inside the material. Their formation is explained by a combination of heat accumulation and dome formation dynamics, where the dome acts as a microlens shifting the laser focus within the sample. More details here. Concentric rings were observed within the bulk of cellulose films after laser machining with high energy femtosecond laser pulses. The rings originate from an interference effect, where the front of the pulse is reflected from the back surface of the sample and interferes with its tail. More details here. Predicting fracture of materials is a long-standing problem affecting manufacturing and transportation and nuclear industries, and limiting the development of new fracture tolerant materials. The reasons come from difficulties in experimentally observing failure of materials and from the many microstructural parameters involved in the fracture process. The overall goal of this research is to understand the relation between microstructure and fracture properties, in order to design materials with improved fracture resistance. To decouple the parameters influencing the fracture process, we have developed a simplified material (or model material) where fracture is controlled. It consists of sheets of material (e.g. metals or polymers) in which artificial defects (microvoids or microcracks) are introduced using a pulsed laser. The artificial defects mimic defects found in commercial materials during fracture but in a simplified and controlled fashion. Such control over size and location of the defect provided by the laser drilling technique has never been achieved before and offers many opportunities to better understand fracture. 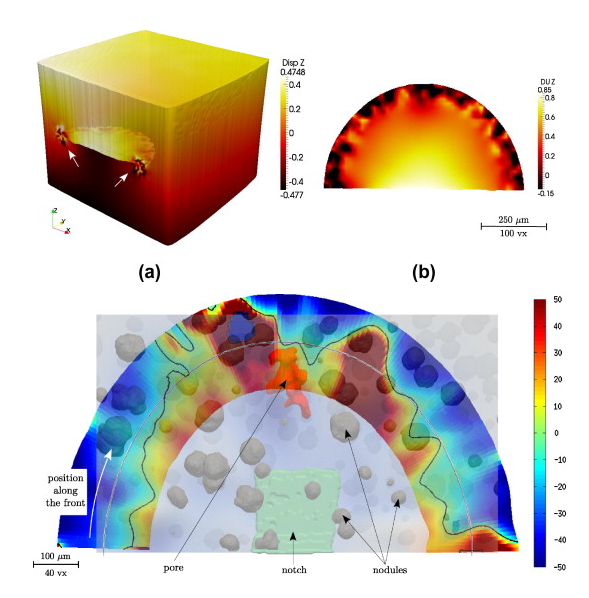 The knowledge from this research program allowed a better understanding of the fracture processes (void growth and coalescence, fatigue crack propagation) and validation of fracture model. The easiest way to create and observe voids is by placing them on the surface of tensile samples. The samples are then pulled in-situ under an optical microscope where void growth and linkage can be observed in real time. We were the first to observe fracture in metals in-situ in a controlled manner, i.e. to be able to follow the growth and coalescence of voids during fracture. More details here, here, and here. 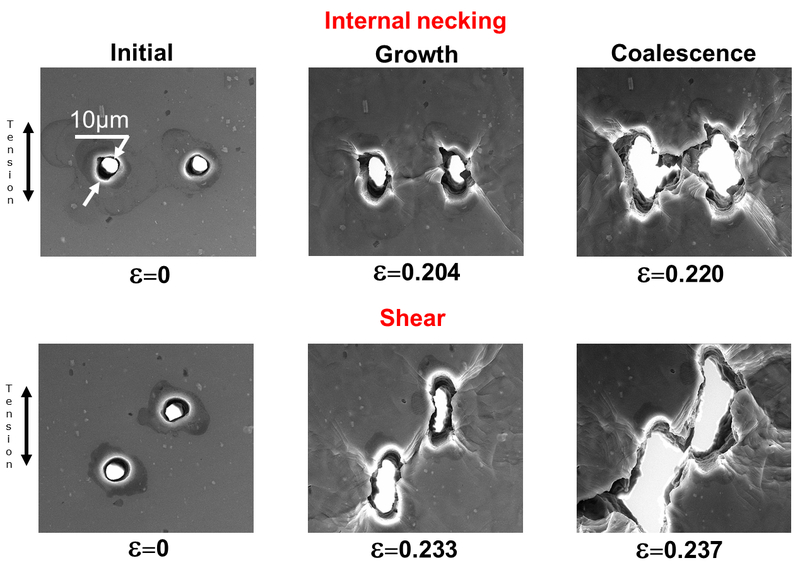 A similar approach was used to investigate i) the effect of work hardening on fracture using pre-strained aluminum alloy samples (More details here) and ii) fracture in polycarbonate containing various arrays of laser drilled microvoids (More details here). Most materials fail because of voids nucleating and growing in the bulk. If the two-dimensional approach presented in the previous section can provide very important information on fracture processes, three-dimensional analyses are required to better represent the behaviour of real materials. To that end, we carried out a three dimensional investigation of fracture. 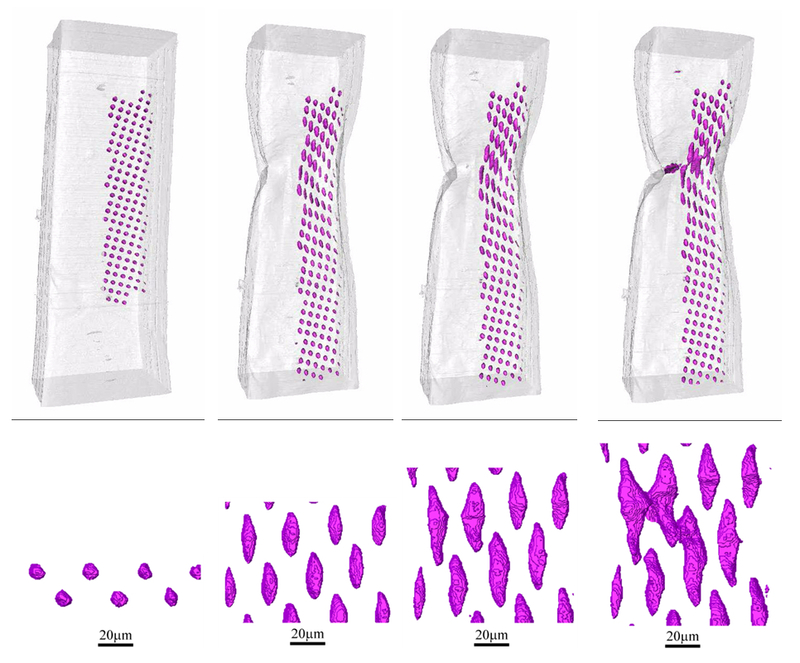 In order to visualize the voids, tensile tests were preformed in-situ in a high resolution x-ray tomography systems. More details here, here, and here. We also investigated fracture in materials that are known to be more anisotropic with a particular focus on fracture in commercially pure titanium which has an hexagonal closed-packed crystal structure. We investigated the effect of grain orientation on void growth and fracture in titanium by placing artificial voids in grains of different orientation. More details here. An artificial defect (notch) is introduced at the surface of a miniature metallic fatigue sample. The initiation and growth of a fatigue crack from this defect during constant amplitude cycling is monitored in situ by laboratory X-ray tomography. Stress Intensity Factor (SIF) values at the crack tip are extracted from 3-dimensional images of the sample. More details here.